The Zionist IDF arrested the child Anan Naji Tamimi for the third time during the last forty days. Anan was arrested last month form his home at 3am in the morning , his charges was participating illegal protest and throwing stones according to a picture one of the soldiers took during the protest for one of the children while he threw stones. The lawyer has proved that the pictures that they had is not of Anan and they released him after paying 500 dollars guarantee. The general attorney threaten him that he will arrest him again . After one month, they arrested him again from his house at 2am in the morning , investigate him for 2 hours, beat him and show him the same picture they show the first time. Anan insisted that this pictre is not his and thats why he was realsed the first time. At 4am in the morning hand cuffed , blind folded the Zionist army released him after they threw him in an empty area and told him to go home alone. He struggled till he could remove the fold from his eyes and walk about half mile on a settler’s street alone. He said that he was very afraid that one of the settlers could see him and maybe they will beat him to death, he reached his home shaking from cold and fear, his hands were swollen from the tight hand cuffed. This morning after one week of this incident, they [the Israeli military] arrested him for the third time on his way to school, according to the same picture. Anan is now in Ofer prison and tomorrow he has a hearing for the same cherges (participating illegal protest and throwing stones, as they said they have evidence which is the same picture that the judge refused in the first time because it was obvious that the person in the picture is not Anan ). This is one story of what our children have to face and how much they have to suffer from this Zionist occupation . *editor’s note: Anan is the eldest son of Nabi Saleh leader, Naji Tamimi, who was recently released from Israeli prison after spending one year as a political prisoner for his non-violent activism against Israel’s occupation. Naji was arrested and jailed by Israel’s occupation military courts for organising and participating in non-violent demonstrations against the Occupation. Nabi Saleh: Israeli Soldiers Shoot 15 year old in the face with rubber bullet The bullet shot from a short distance hit the boy in the face penetrating his right cheek and piercing it. Diplomats from four countries visited Kufer Qaddoum. Portuguese Head of Mission hurt by tear-gas. Israeli Border Police officers shot a rubber-coated bullet at 15 year-old Ezz Tamimi’s face from a distance of about 20 meters, during the weekly demonstration in the West Bank village of Nabi Saleh today. The bullet, which hit the boy’s cheek, went through it, gouging a large hole in it. The Israeli army’s own open-fire regulations forbid the use of rubber-coated bullets against minors. The incident took place at the center of the village ,hundreds of meters away from where a demonstration was taking place, when Border Police officers invaded the village. For the first time in months, protesters managed to reach the vicinity of the contested water spring, which sparked village demonstrations over two years ago when taken over by settlers. The protesters, mainly women from the village, managed to confound the soldiers by advancing towards the spring from an unexpected direction. The protesters who were held back by the soldiers meters away from the fountain proceeded to block the road leading to the adjacent Jewish-only settlement of Halamish for some 20 minutes. The previous night, the Israeli army staged another nighttime raid on the village, an what has become an almost nightly practice in the past three weeks. Kufer Qaddoum A delegation of foreign diplomats visited Kufer Qaddoum south of Nablus, after soldiers sicced a dog at one of the protesters last week, causing him serious harm. During the visit, several of the diplomats suffered from the effects of tear-gas, shot at protesters to disperse the demonstration. Jorge Lobo de Masquita, Representative of Portugal to the Palestinian Authority , as well as a South African diplomat were rushed to an ambulance, where they were given first aid for tear-gas inhalation. RAMALLAH (Ma’an) — At least eight Palestinians and an Israeli activist were injured on Friday during demonstrations in the West Bank, witnesses and activists said. Israeli activist Naomi Laet, 22, suffered head injuries in Nabi Saleh after being hit by a rubber bullet fired by Israeli soldiers, a statement from the Popular Struggle Coordination Committee said. 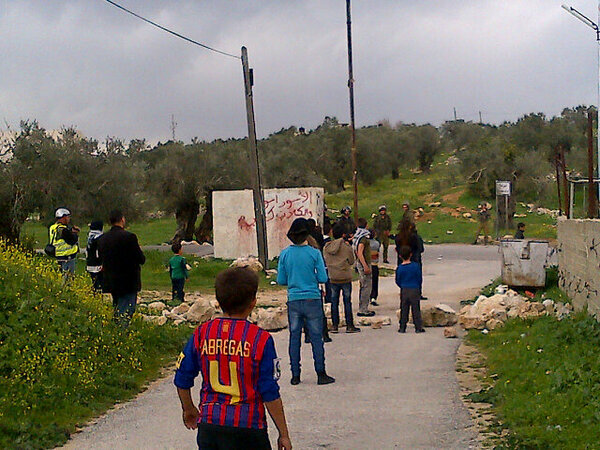 Israeli forces had earlier entered the village and sprayed protesters with a foul smelling liquid using water cannons. 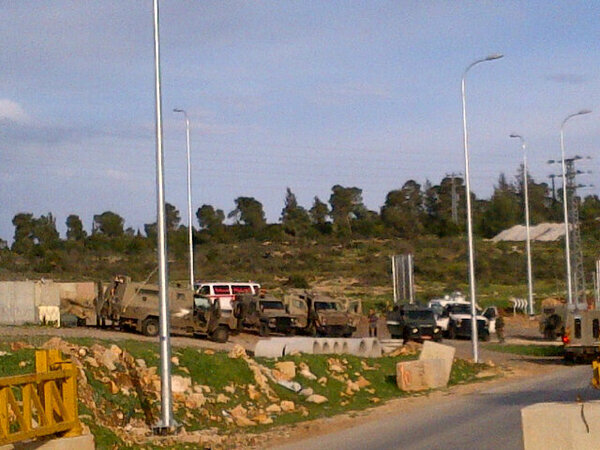 Eight Palestinians were reported injured in the village. An Israeli military spokeswoman said 40 people gathered there and hurled rocks at army forces, and the army used riot dispersal means. Failing to disperse the crowd, Israeli forces fired rubber bullets, she said. Witnesses told Ma’an that Israeli forces refused to allow medical crews to reach the injured, holding medics at the entrance to Nabi Saleh. Three people were also reported injured in a demonstration in the Nablus village of Kafr Qaddum, a Popular Struggle Coordination Committee statement said. The weekly protest was dedicated to the memory of Rachel Corrie, an American protester who was killed in Gaza nine years ago after being run over by an Israeli bulldozer. 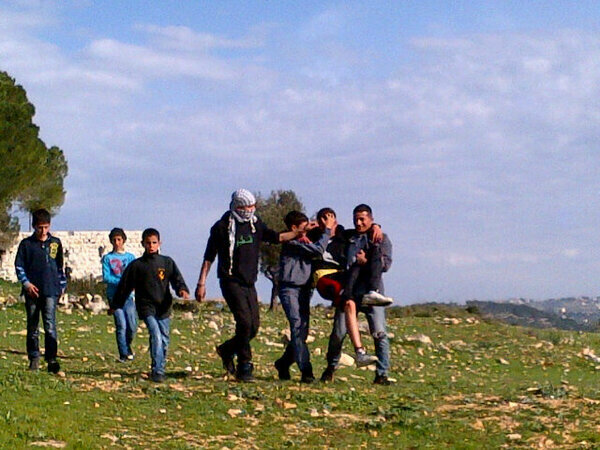 Two demonstrators were injured when Israeli forces fired tear gas projectiles at them. One was hit in the leg and one in the shoulder. Border police also released a dog which chased after protesters and locked its jaws on Ahmad Shtawi. The incident was caught on tape by Ma’an affiliate Nablus TV.